Entry of Jio 4G into the Indian telecom sector has started a fierce battle between all the major telecom players. Therefore, all the big players in the market like BSNL, Airtel and Vodafone are coming up with new and exciting offers for their customers. Jio 4G has already become very popular because of free and cheap services offered by it. However, now we are getting even better services from the rival telecom players. To tackle the competition from the Jio, BSNL has come up with triple offers for three different types of users. These three offers are "Dil Khol Ke Bol", "Triple ACE" and "Nehle Pe Dehla". Earlier, BSNL launched the plan 339 which gave the advantage of 2 GB data and 25 minutes of free STD and local calls per day (update- now BSNL has increased daily data limit to 3 GB per day). 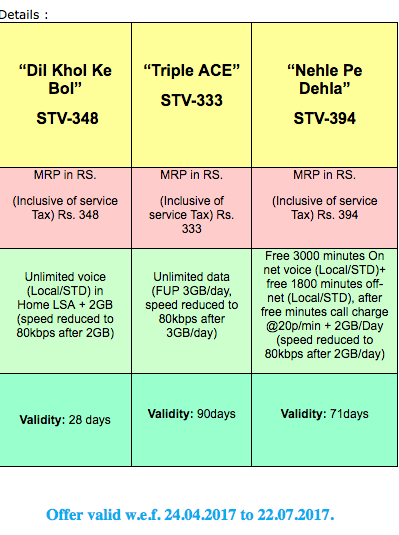 These Three new offers are introduced by BSNL to further strengthen its base and offer competitive plans. The first plan "Dil Khol Ke Bol" is for those people who want to talk unlimited and want to enjoy some data. Under this offer, they will get unlimited calling (both local/STD) from their Home network and 2 GB data after completion of data speed will reduce to 80 kbps. The second Offer "Triple ACE" is for people who enjoy downloading lots of stuff from the internet. Under this pack, they will get daily 3 GB data at full speed and then after at a speed of 80kbps. This service comes with validity of 90 days. This plan is ideal for using in a data card and we can save the three month data bills with this pack. Third pack is "Nehle Pe Dehla" which gives you everything from free minutes to daily data and long validity. Under this offer, you will get Free 3000 minutes (local/STD) for same BSNL network and 1800 (local/STD) minutes for other network calls. You also get the option to use a high speed data for 2 GB/day, then after speed reduces to 80 kbps. This pack also comes with long validity of 71 days. I hope that these plans of BSNL are likely to give tough competition to all the major telecom players.